I have a new book deal with Lake Union (the publisher of In The Light of What We See) and I couldn’t be happier! As I have mentioned before, the working title of the book is Beneath The Water and it is set in Arisaig on the west coast of Scotland. I am working on edits with the Lake Union team right now, and it will hopefully be out early next year. 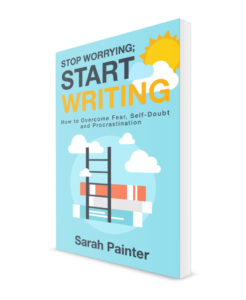 In other news, my non fiction book, Stop Worrying; Start Writing is out this Friday (14th April). If you are a writer (or interested in becoming one) or just want an insight into the creative process, then do check it out. It will be available in print and ebook on all major retailers, with an audio version coming later this year. Finally, an explanation for the ‘huzzah’ in the title of this post. I spent last week with my lovely in-laws, including my delightful niece. She is twenty months old, has a fabulous vocabulary and picks words up brilliantly. If you thought there was anything cuter than a toddler shouting ‘huzzah’ while throwing her arms into the air with joy, then you would be wrong.